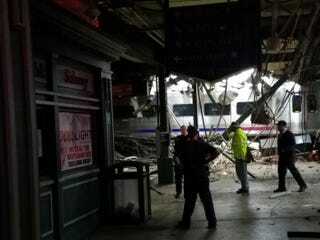 A New Jersey Transit commuter train smashed through a wall at the Hoboken Terminal train station in Hoboken, New Jersey. One person is confirmed to have died, and at least 100 people have been injured, according to the local ABC affiliate. Jennifer Nelson, director of media relations for New Jersey Transit, said that of the 100 injured many were in critical condition. Passengers on board the train told WNYC’s Nancy Solomon that it felt like the train was moving “way too fast” and “wasn’t slowing down” before the impact. Multiple people were on the ground writhing in pain, Solomon reported. Witnesses reported everything from scrapes and bruises to broken bones. Passengers told ABC that the train involved was number 1614 on the Pascack Valley Line, which departed from Spring Valley at 7:23 and was due to arrive in Hoboken at 8:38. Local fire officials have told NBC New York that they are investigating the crash as a possible derailment. UPDATE: One woman, Fabiola Bittar de Kroon, 34, of Hoboken, was killed, reports CNN. She was standing on the platform and was hit by debris.